The winner will be announced at tonight’s banquet at Croke Park. Dublin's Michael Darragh Macauley is nominated. 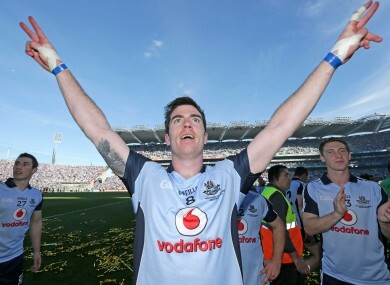 THE 2013 FOOTBALLER of the Year will be unveiled tonight at Croke Park. This year’s GAA/GPA Allstars banquet, sponsored by Opel, takes place at the venue. In the running for the award for leading footballer are Dublin captain Stephen Cluxton and his teammate Michael Darragh Macauley. Mayo defender Lee Keegan completes the list of nominations. But who do you think should win the award? Email “Poll: Who should win the 2013 Footballer of the Year award?”. Feedback on “Poll: Who should win the 2013 Footballer of the Year award?”.